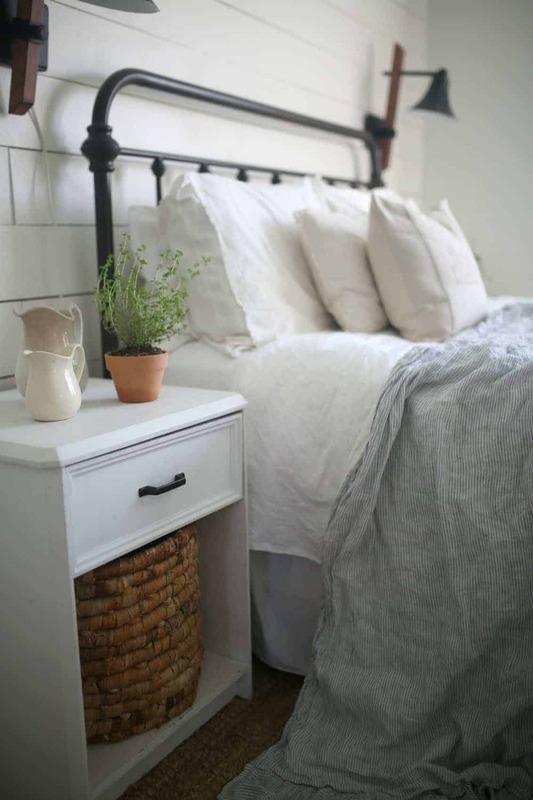 Take a peak at my farmhouse bedroom simply decorated for Easter with a natural elements such as herbs and wood tones. Some links in this post are affiliate links, which means I make a small commission at no cost to you. See my full disclosure here. I hope you are enjoying each and every stop the Easter Parade blog hop! If you are coming over from Summer Adams Designs , welcome! I am so glad you are here! Enjoy my tour, and be sure to check out the next stop on the blog hop, at the end of this post! I am such a simple girl. I literally do not own a single necklace or pair of earrings. My shoe collection consists of a pair of wedges and a pair of flats. I have gone through seasons of my life where I have tried to be a little more fancy, and get some high heals, red lipstick and gold dangle earrings. Everyone else seems to look so amazing with bold lipstick and a trendy new hair color. I think my personality was just never meant for it. I definitely tend more toward minimalism. I function best in spaces that are uncluttered and neutral. And my kids’ room…well, that’s another post entirely. For our Easter bedroom, I kept it simple and minimal. 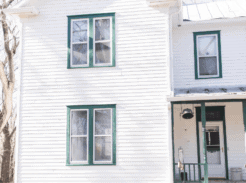 The walls are painted with Benjamin Moor White Dove. 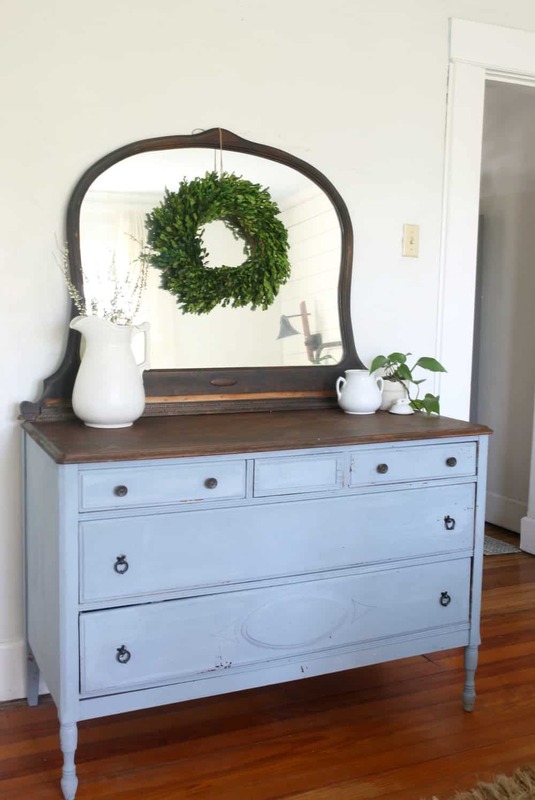 The dresser is painted with Miss Mustard Seed Milk Paint in Shutter Gray. I painted all the doors, trim, baseboards and crown molding with Benjamin Moore white paint straight off the shelves. I just feel like you can’t go wrong with white! I added some potted herbs to the nightstands, because nothing says early spring like potted thyme and parsley. 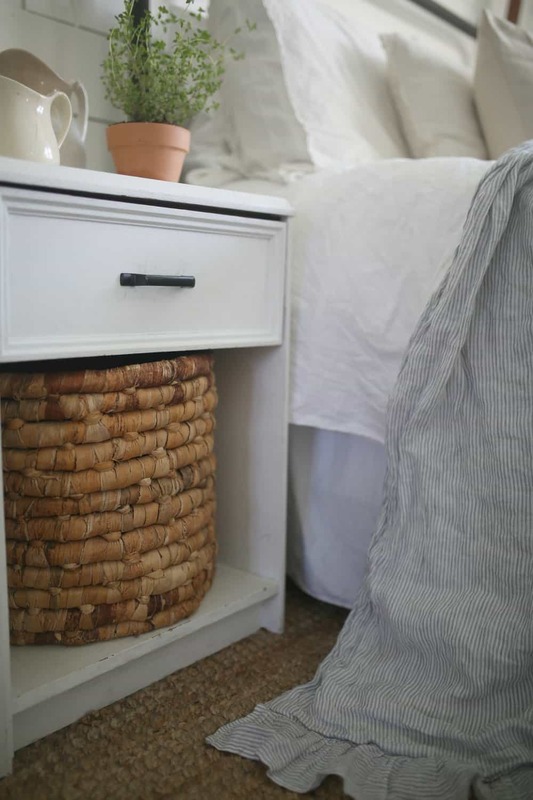 I found the basket, that is in the night stand, a few weeks ago, at a garage sale. It fits perfectly. To avoid folding my kids laundry and putting it away, I shove it in this basket. Then, when they need outfits in the morning, I don’t have to go to their rooms. I just pull the unfolded clothes out of this basket and get them dressed. I designed this “He is Risen” pillow this year for the shop. I wrote a tutorial on how to make this striped linen ruffle throw. 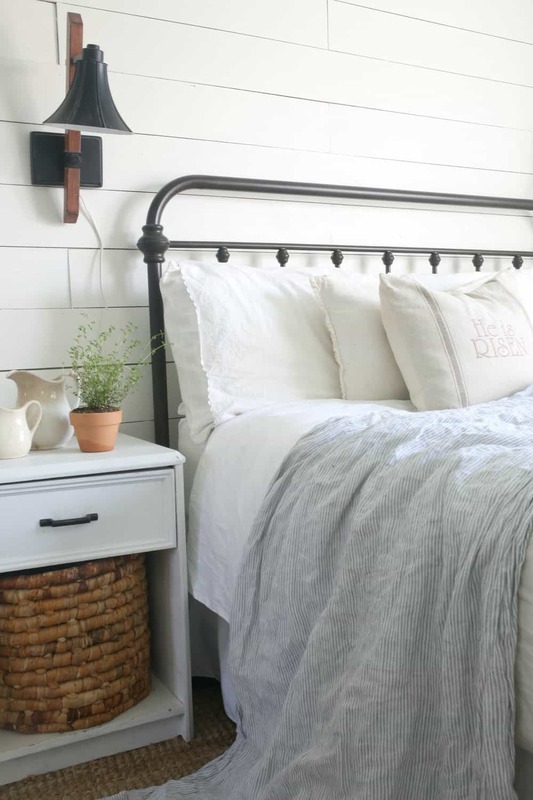 It really is super simple, and love it on the bed for spring! 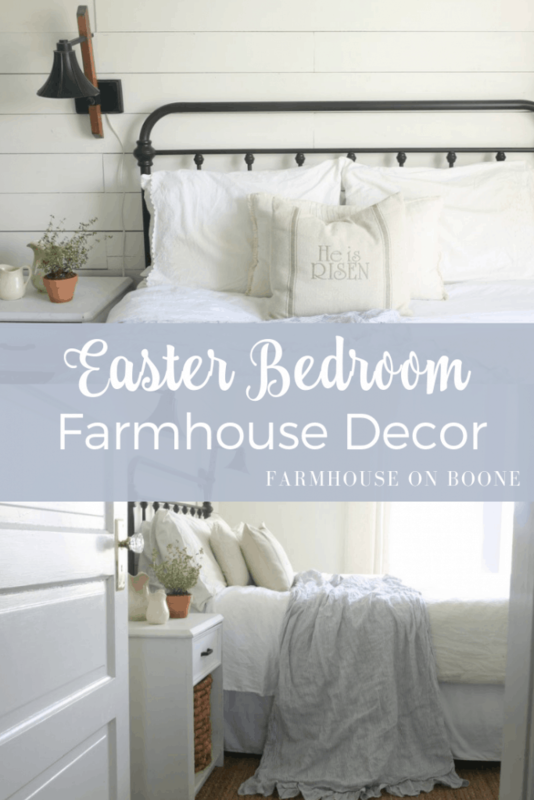 Thank you so much for stopping by simple farmhouse Easter bedroom! Next Stop on the Easter Parade blog hop is Sheila at Maison de Cinq. Head on over to her beautiful blog for some Easter inspiration. 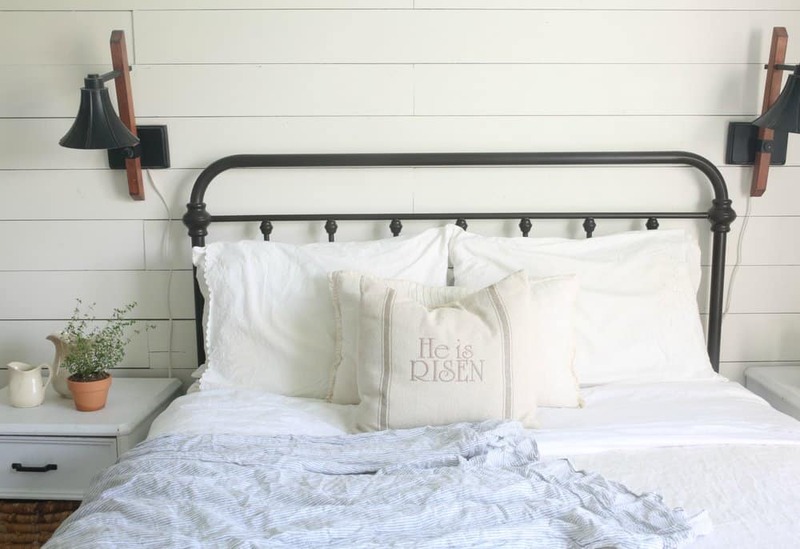 Love your minimalist farmhouse bedroom, and I’m so glad I discovered your blog recently. I’m also very simple – 4 pairs of shoes, very little jewelry, no makeup. I do need to get my hair cut soon as it’s been about 3 years, but it’s so easy to just twist and clip or put it in a pony and not have to mess with it. Can’t wait to receive my custom farm pillow I ordered from your shop last week! Happy Easter! Hey Christy! Thank you so much for stopping by the blog and for your sweet comments. I am glad to know I’m not the only woman who forgets all about that girly stuff like makeup and shoes. I want to be into all that, but I just forget it’s a thing. LOL Also, thank you for your order! I hope you love your pillow!! 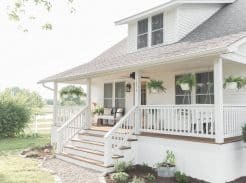 Your house is so pretty – it’s literally the perfect farmhouse! 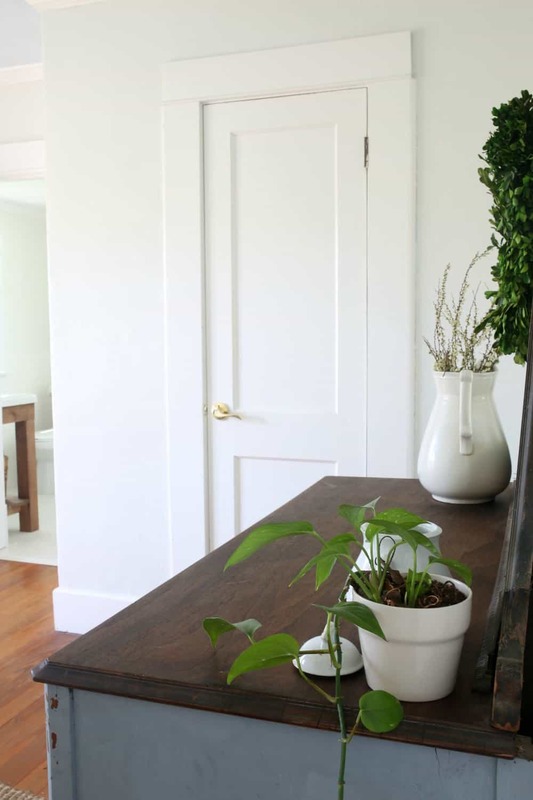 I love the simplicity, and I too have gravitated towards more neutral interiors these days. 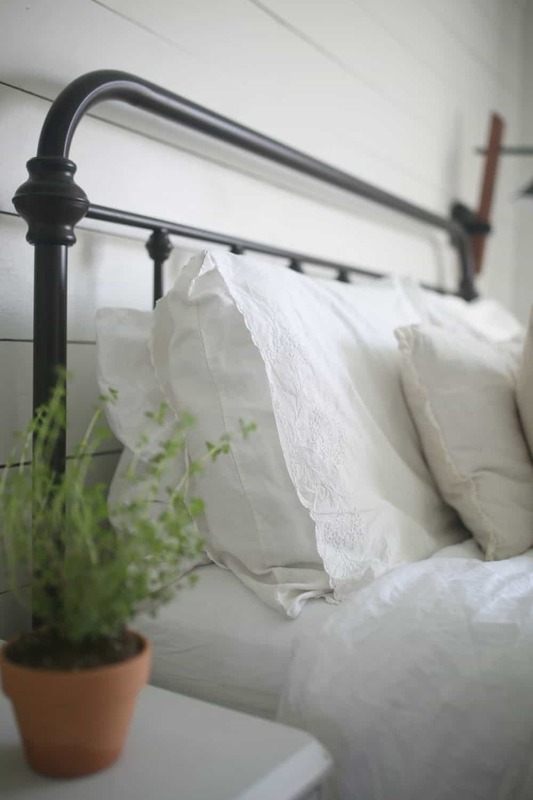 I love your little nod to the season with your cute pillow and the herbs. So sweet and subtle! Thanks so much for "hopping" with us! Thank you so much Sheila for your sweet comment and for including me in this blog hop! 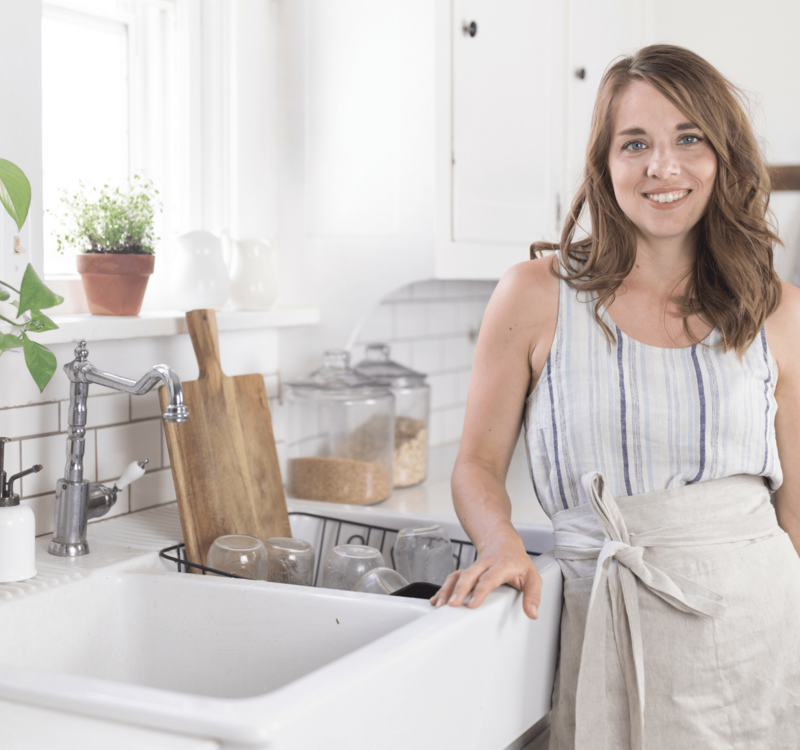 Your home has such a simple beauty – I just love it! 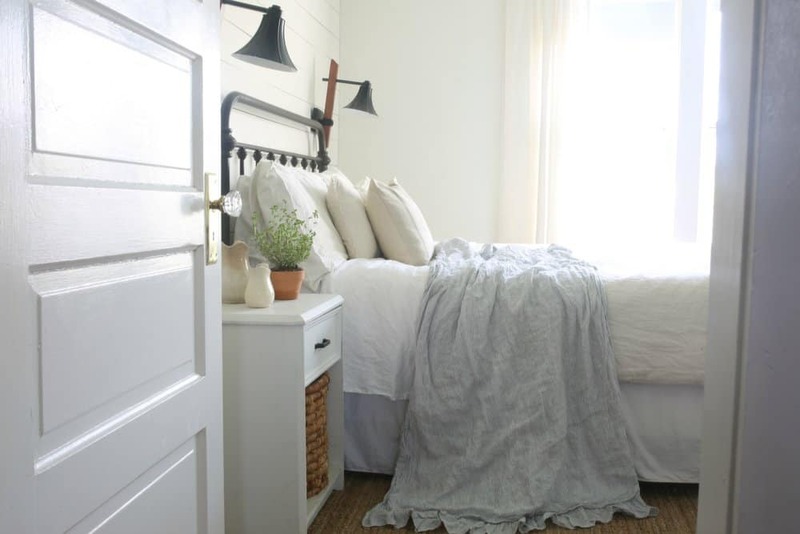 And your bed linens look so cozy – perfect for your casual, unfussy style. Hello Lisa! Welcome to the tour. 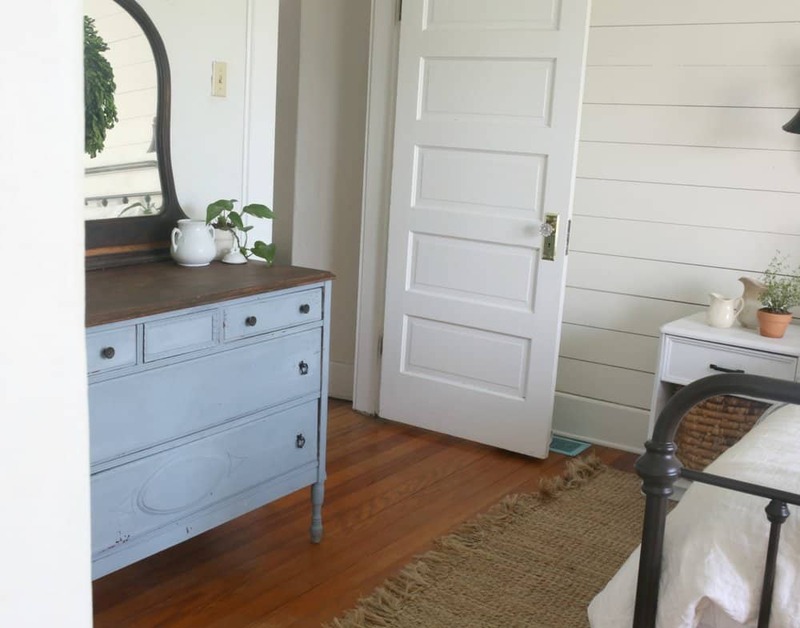 I just love your relaxed farmhouse Spring touches. As I mentioned on IG the He has Risen pillow is my favorite! Awww thank you sooo much! Hi Lisa, I love your relaxed vibe! This room is beautiful in every detail. Your He Is Risen pillow is designed beautifully. So nice doing the tour with you! Hi Lisa, can I just say that I LOVE the simplicity that you’ve embraced. It’s so refreshing in such a media-saturated, consumer-driven culture. I long for simplicity, as I know many others do, so this really spoke to me. Your post was beautiful! 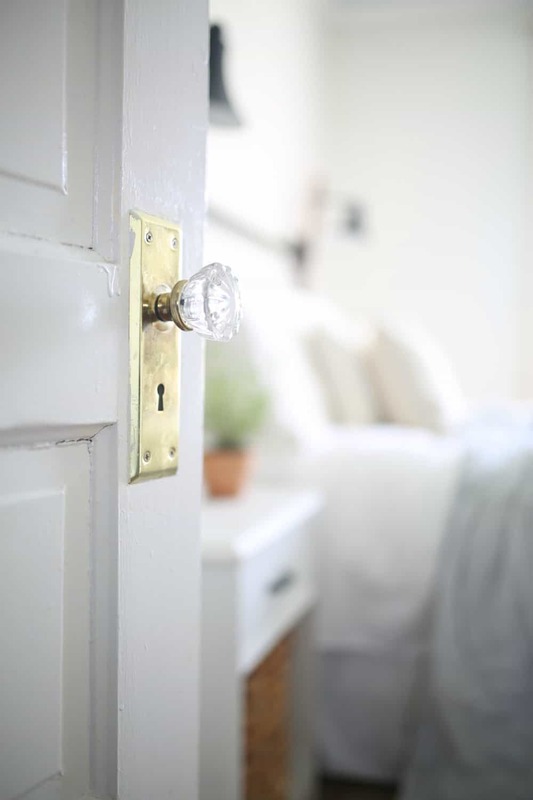 Your home looks cozy and inviting, and I love the sweet little touches that you added to your bedroom for Easter. 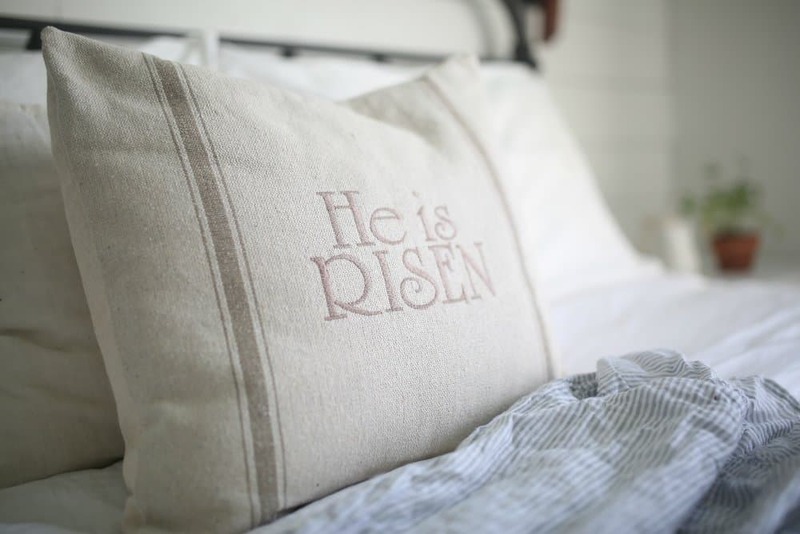 Your "He is Risen" pillow is beautiful! I’m honored to have been a part of this blog hop with you! Thank you so much for your sweet comment Jennifer. I loved being a part of this blog hop with you!